Women Ministries serves as a vital tool to grow and strengthen the church. We seek to connect women in transformational relationships and unite them in Christ to impact our world. Our ministry provides women opportunities to GROW in their relationship with Jesus Christ, to SERVE others with our own unique callings and giftedness, and to advocate for women and children, both here and around the world and to REACH OUT into our community with the good news of Jesus Christ. To encourage kingdom growth, we have several different women’s groups to make it easier for you to join in. There is a Women’s Bible Study, fitness group, CEC – Conversational English Classes, Prayer Shawl group and more! Others have also gone on special outings such as touring Pewabic Pottery, historic home tours, dinner theaters and more. All events and meetings are open to anyone who wants to attend denominational levels of Women Ministries. Statistics indicate that 1 in 4 adult women in the U.S. has been sexually abused. Other forms of abuse are typically present as well: physical, emotional, verbal, or psychological. The good news is that there is HOPE, HELP, and HEALING from the damage of this trauma. 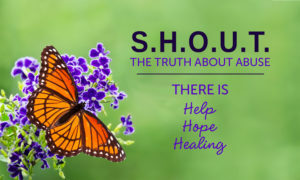 Faith Covenant Church offers that hope through the S.H.O.U.T. program for women. If you know someone who could benefit from this ministry, please contact Sheri Fornell at 734-536-7131 or send an email to sfornell@twmi.rr.com to learn more about S.H.O.U.T. All calls are completely confidential. PLEASE NOTE these fees do not include housing. Join us July 18–21, 2019, for a triennial gathering for women by women! In the Evangelical Covenant Church, we believe that women are called to be disciples and disciple makers.